BRING YOUR OWN BAGS. Then you can refuse the plastic shopping bags, especially all the ones from the green grocers. Remember, you can buy cotton bags for only LE 5 from Ibrahim the tailor on Fanar Street. BRING YOUR OWN CONTAINERS. Use them to buy all sorts of goods in bulk – butter, cheese, flour, rice, nuts, spices, and more. MAKE IT YOURSELF. Skip the plastic-packaging and make your own! Bread, snacks and sweets, pasta, drinks – you name it and you’ll find a recipe online for it. DRINK WELL WATER OR BUY WATER IN RETURNABLE BOTTLES. BUY THE LARGEST PACKAGE AVAILABLE. Skip the individual size packages. Instead buy the largest box or bottle possible. This cuts down on the amount of plastic needed for each product. I will continue to share tips and practical advice on shopping for food with less plastic. I will also start to discuss how we can reduce the plastic involved with household cleaning and self-care products so visit again soon! Taking a Day Trip…without the Plastic! Last week, my husband and I took a day trip to Nuweiba. I carefully packed a bag with my swimsuit, snorkel, water shoes – everything we’d need to enjoy a dip in the sea. My backpack carried our paperback books, my cameras, and my current crochet project. Food would be taken care of in Nuweiba. And pictured above are the items we packed so that we could avoid buying or being given plastic bottles of water – a 10 L reusable bottle with a few liters of well water, a reusable stainless steel water bottle, and two stainless steel cups. I keep my water bottle with me at all times so that one is easy to remember. But I knew that wouldn’t be enough water for the day so I grabbed a large container of well water so that I could refill my bottle whenever we needed. I brought the cups in case we felt like drinking from those instead (We didn’t.). I have my own car so it is easy to throw these things in the backseat, but bringing these items along with you on an organized day trip shouldn’t be difficult either. There’s usually plenty of room in the Jeeps, Landcruisers, or minivans that are driven on these adventures in Sinai. If you’ve organized a trip with a local tour company and you want to skip the plastic water bottles, let your tour guide know that you will be bringing your own. I have never been a soda drinker but used to enjoy a cold tonic water and lemon in the summer. I also love juice. But I gave up both bottled tonic water and juice in Tetra Paks several years ago when I started out on this journey to reduce my plastic waste. This was not a hardship for me as there are several plastic-free options for refreshments that are healthier, tastier, and less expensive. Option #1: In Egypt, shops selling fresh juice can be found on almost every street and we have several here in Dahab. Take advantage of these! You can stop by the shops and enjoy a glass right there. (Try to remember to tell the juice man that you do NOT need a straw.) Many of the shops also sell fresh juice in reused 1 ½ L plastic water bottles, which is better than a new plastic bottle. If hygiene or time is a concern, bring your own bottle and ask them to fill it with your favorite juice. Nadim and I have done this often with ‘asab (sugar cane juice). Option #2: Make your own juice! Visit the fruit and veggie stalls and choose your favorite summer fruits. Remember to bring your own reusable bag. 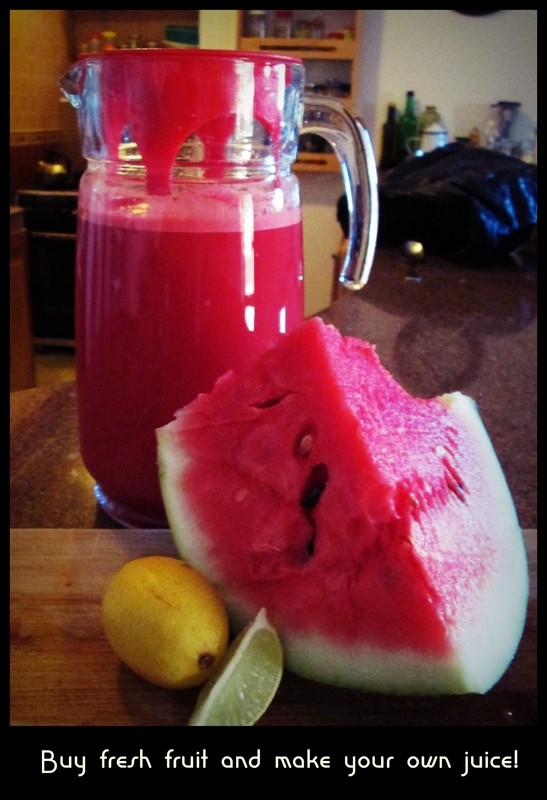 My favorite mix at the moment is watermelon and lemon. I’m lucky enough to have a blender but it’s not necessary. You can also use a squeezer or handheld juice press, which are easy to buy here in Dahab. Option #3: If you’re not a fan of juice, you can also make other drinks. Karkade is another of my summer favorites. 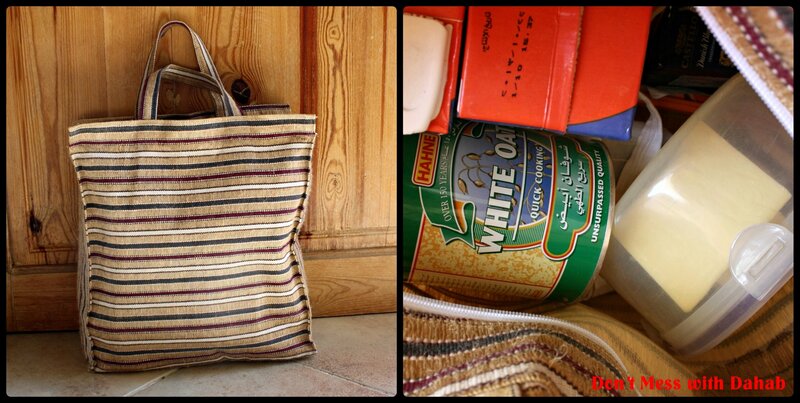 Bringing your own bag and buying the loose karkade from the bulk bags means you can avoid all plastic. Search the Internet for recipes for making your own sodas and other summer refreshments. Get creative! 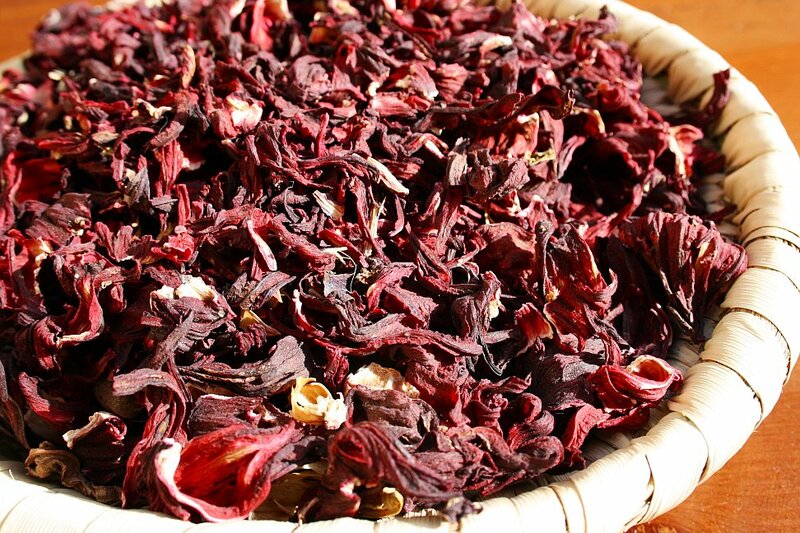 We have many local desert herbs growing in our garden and my husband often makes infusions out of these, which we then chill. Our favorites are shay al-jebel (Pulicaria incisa), dhafrah (Iphiona scabra), and a Saudi mint similar to habaq (Menta longifolia). If you’re going to be spending the day out and about, fill a reusable bottle with your favorite drink and carry it with you. What are some of your favorite plastic-free summer drinks? Do you have any tasty recipes to share? Filtered tap water would be the ideal solution to drinking water as it is the option that involves the least amount of plastic. Well water is also a good alternative to drinking bottled water. But if neither of those options work for you, what are the next best choices? One less-plastic solution would be purchasing water in 19-liter returnable bottles. One brand available locally is Aqua Stone. You can purchase these bottles from Mohsen’s place (across from Marine Garden Camp/Karkor the Butcher). You pay a LE 50 deposit per bottle that is returned to you when you bring the bottle back. The water costs LE 17 per 19-liter bottle. Or LE 16 per bottle if you are buying 10 or more. For more information, call 01003999803 and ask for Mohsen. I am still trying to find a contact at the company that can answer my questions about what happens to the returned bottles. I will report back as soon as I find out anything. 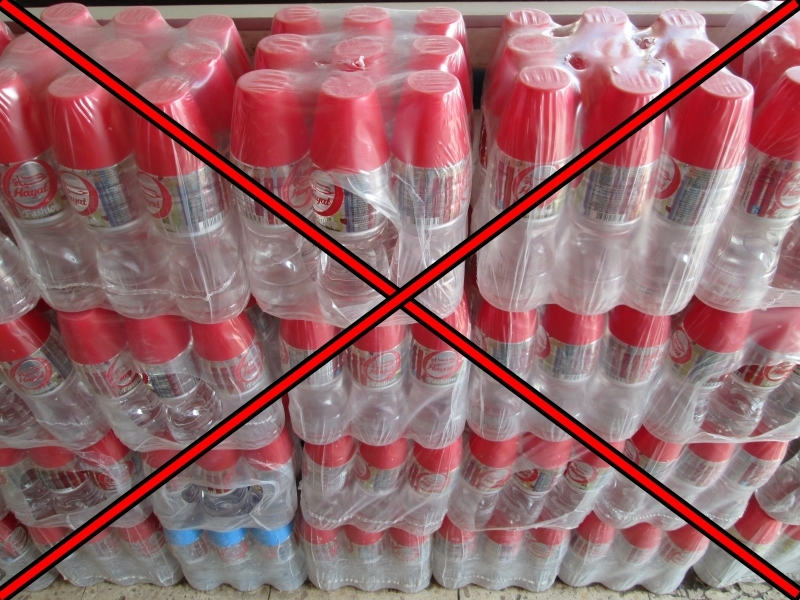 If you choose to purchase these large bottles, you’ll also need to purchase a dispenser. The least-expensive ones are plastic (unfortunately) and simply provide a base to hold and dispense the water. They are available at Carrefour in Sharm el Sheikh for LE 115, according to a friend who purchased one recently. (I purchased one last year and I remember a much lower price.) I have not seen them for sale in Dahab. Has anyone else? The more expensive option would of course be the fancy electric water dispensers that also cool and heat the water. These are available locally and range in price. Be sure to check out the Facebook groups dedicated to selling and buying in Dahab. You may be lucky and find a used one! As a last resort, purchase the largest bottles of water available – at least the 19 L or 6 L bottles. These give you the best product-to-packaging ratio. REFUSE the 1.5 L and smaller bottles. And please REFUSE these small water bottles that now also come with a plastic cup! TIP: Purchase a large water cooler/dispenser, like the TANK brand thermos dispensers, to put in your kitchen. Empty the water from the large bottles into the dispenser. This will make it easier to pour a small amount without having to lift a heavy bottle each time. TIP: Purchase a reusable water bottle to carry with you. Or use a glass mason jar or other container that you already have. Bring it with you to school, work, or play time at the beach! I also bring my own water bottle with me to restaurants. As long as I am ordering something, no one in Dahab has had a problem with this. 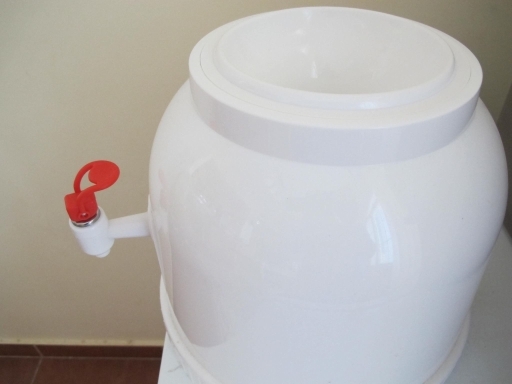 What are other solutions or resources for obtaining drinking water in Dahab using the least amount of plastic? Filtered tap water may be the ideal solution to drinking water in Dahab, but as we continue to research those options, what are our other choices? One option – my personal preference and one used by many local residents – is the water that is collected from various wells or springs in south Sinai. There are many Bedouin and Egyptian men who drive trucks to these nearby locations, fill large jerry cans or tanks with the water, and then deliver the water to customers in Dahab. Typically, if you are buying from a truck with the big blue jerry cans, you purchase the water by volume, in 60-liter amounts. Because the storage and transport of the water is unregulated and potentially unhygienic, many people do not want to use this water. 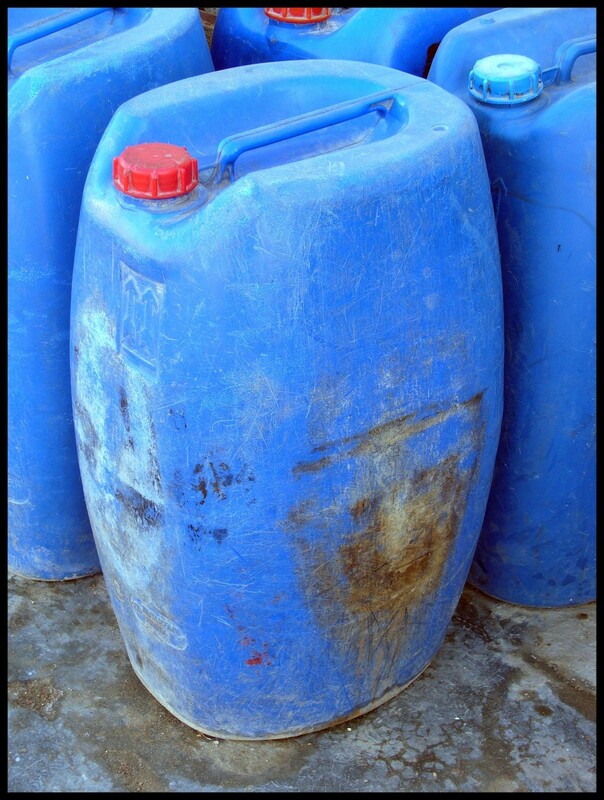 The blue jerry cans often used to transport and store well water. We call a Bedouin man who sells water, inquire whether he is in town and has water in stock, and arrange a time for delivery. He brings the water in large blue jerry cans in the back of his pick-up truck and uses a hose to fill our ten large water bottles, and sometimes another three 25-liter jerry cans. We pay him LE 10 for each of the 60 liters we have received. We then purify the water with disinfectant chlorine drops and store the bottles inside or outside, covered and in the shade. Before we use the water, we run it through a Brita (charcoal) filter to remove the chlorine and some of the minerals present in the water. Three 25-liter jerry cans and the 1-liter pitcher I use to move water from them to my filter/dispenser. We have purchased water from a variety of sellers/wells over the years and the water is always delicious! We have even had rain water delivered. 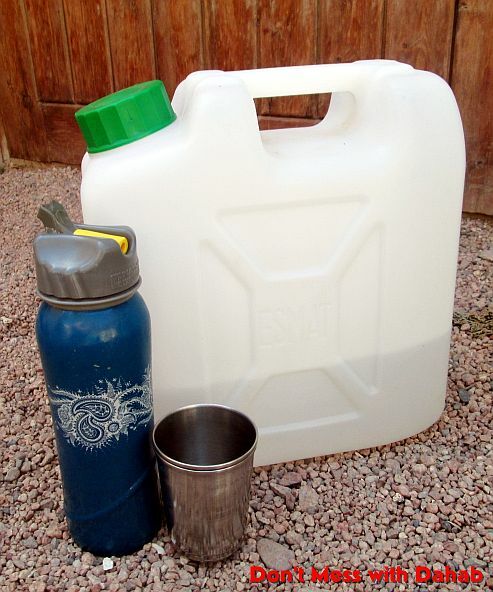 TIP: If you’d like to start using the well water, start by purchasing one of the large blue jerry cans or several of the smaller white jerry cans (if you don’t want to deal with moving the weight of the large ones). Next, ask a friend or neighbor for a recommendation for a “water man”. If no one has a recommendation, flag a truck down when it passes on your street – listen for the honking of the horns. Get his phone number so that next time you can call for delivery. 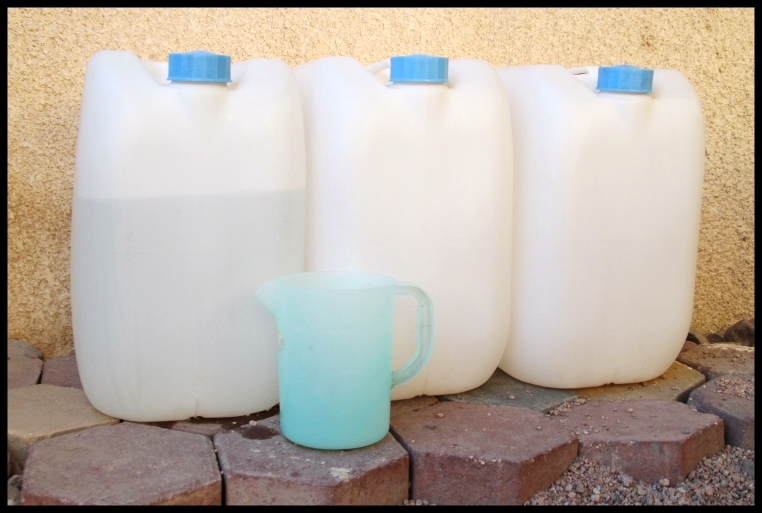 TIP: Be aware that the price of the water will vary depending on the source and can range from LE 10 – 20 per 60 liters. Some water comes from wells that are further away and some water comes from wells that contain less minerals and so is more expensive. I have consumed plenty of “untreated” well water over the years and have never gotten ill. I would drink well water, from a known and trusted source, even if I didn’t disinfect and filter it myself. This of course is a personal choice we each have to make. TIP: Choose a simple water purification technique. Boiling is one option. Chlorine or household bleach is another. This Department of Health website recommends 5 drops of household bleach per liter. Do you drink well water? If not, would you be willing to switch to well water? Why or why not? Read Part 1 of this issue. Stay tuned for Part 3 for information on other drinking water options. So far I’ve focused on REFUSING the single-use plastic bags provided by most shops and using cotton bags instead. I know there are some of you already doing this and others who are working on cultivating this habit – and that takes time. While we continue to REFUSE plastic bags, let’s talk about our other huge plastic waste problem here in Dahab – the plastic water bottles! Along with plastic bags, plastic bottles are among the most prevalent sources of pollution found on our beaches. The extremely slow decomposition rate of plastic bottles leaves them to drift on the ocean for untold years. 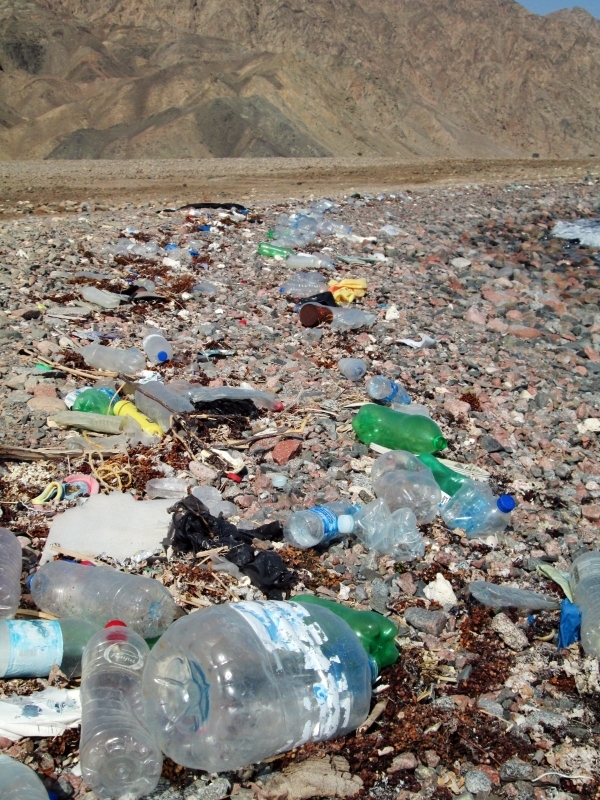 Plastic trash, mostly bottles, washed up on the shore of Nabq Protected Area – just 10 km south of Dahab. It takes three times the volume of water to manufacture one bottle of water than it does to fill it, and because of the chemical production of plastics that water is mostly unusable. 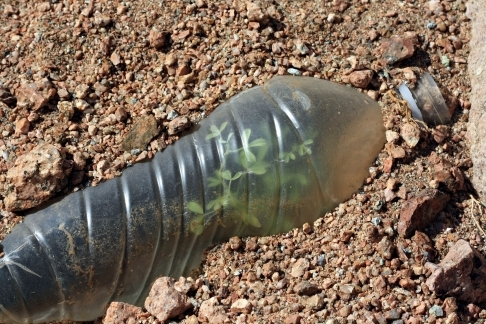 Plastic bottles plague our deserts, too! I am sure many of us know that drinking bottled water is not the most eco-friendly or healthful habit around and the facts above help to clarify why. It’s common to read on American or European blogs about how practical and economical it is to simply drink tap water and use refillable bottles instead of buying water in plastic bottles. In fact, in Cairo, that is exactly what I did. I did not like the taste (or the price!) of bottled water so we installed a charcoal filter (to get rid of the chlorine that is added during the purification stage) directly to an incoming tap in the kitchen and had clean, tasty water at our disposal whenever we wanted. I filled reusable water bottles to take with me to work and other outings. In Dahab, however, water is another story! Most of us are ecstatic just to have tap water provided by the city. If we’re lucky, the water comes on a regular basis and we have a large enough water tank to cover our needs until the next delivery. Many residents are still not connected to city water and must call a water truck every couple of weeks to refill their tanks. Water that doesn’t have to be delivered is a convenience that I waited nearly five years for and for which I am very grateful. So the issue of water is a bit more complicated here in the desert. In theory, the desalinated water provided by the city to the homes of Dahab is drinkable. It has been processed and purified. The problems are with delivery and storage – dirty trucks, pipes, or tanks that render the water unsafe or unhealthy to consume. Therefore, the majority of residents do not drink this tap water, myself included. Even with the filter attached to the main pipe – I have seen our filters dirty with rust! Two of my goals for this year is to find out the easiest way to test my water and then research the 3- and 5-stage water filtration systems that are sure to make my tap water drinkable. So until I have more to share about filters, what are our less-plastic or plastic-free options for drinking water here in Dahab? I’ll be discussing those in upcoming posts so stay tuned. What is your source of drinking water? Do you have a filtration system in place?